After the success of their previous installment, Philippine directing team Pegue Gallaga and Lore Reyes returned for their second turn at the popular anthology series. Released a year after the second entry, rather than take the gap that occurred between part one and part two, this third film in the series keeps the same tone and sense of fun as what had been in place from the first films. 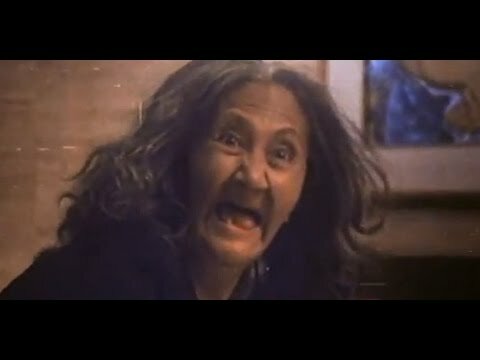 After moving into a new house, Lydia (Rosemarie Gil, from “Bruka, Queen of Evil”) and her daughter Tanya (Kris Aquino, from “Crazy Rich Asians”) become concerned something is in the house with them when they find their housekeeper scared out of her mind and raving about the grandchild not being safe. Realizing that she’s become the target of a vile Yaya spirit, she resorts to desperate measures to keep her child safe from the evil spirit. This is an extremely effective way to start the film off. Within the first few minutes, the first supernatural action occurs with the wind blowing ominously through the house and then finding the woman hiding in the closet in hysterics clutching the baby. Her later story about the malicious spirit supposedly following her is incredibly chilling, and when followed by the beings’ appearance at the house, which signals a truly exciting attack with the holiday decorations left up being destroyed by the furious winds, there’s a great sense of cheese present. The rest of the segment plays off in the familiar nature of a woman concerned for her infants’ safety against a malevolent being trying to steal it, which is a real universal fear and is carried out in some great sequences . This includes the attack on her boyfriend and the spirit setting the house on fire to get to her baby. These here help to really get this going nicely. After hearing of her sister’s death, Rosalyn (Janice de Belen, from “Tiyanaks”) decides to leave her studies to return home to be with her family, only to learn that Rowena (Gina Alajar) is still alive in a zombie-like state. Finding her under the control of Dr. Redoblado (Subas Herrero, from “Black Mama, White Mama”), a vicious devil-worshipping cult leader, she tries to free her sister and return her back to her natural state. This segment had a lot to like, although there are some issues. One of the few troubling factors is the fact that this is somewhat longer than it needs to be, due to some unnecessary scenes. These include the pranksters at her school who are in the office before she is or the talks with the various occult experts to gain more info about what’s going on. These just make the segment way too overlong and could’ve been trimmed somewhat or even expanded with a bit more subplot into a feature-length effort. However, once past those issues, the segment is wholly enjoyable. The atmosphere surrounding the strange cult and its dealings, carried out in strange silence and efficiency, creates a rather mysterious and engaging opening. From there, seeing his powers as he forces her into eating dirt from the planters or the series of special ceremonies conducted in the basement of the house really boost this one considerably, as it leads into the thrilling finale. Fully aware of the cult’s plans and how dangerous they are, this action has plenty to like in addition to the chilling resolution that concludes the segment. It’s either a bit too short or not long enough for this format. Joining her friends on a field-trip, Maloy (Manilyn Reynes, from “Aswang”) heads out with the rest of her class to a nearby lake, only to find one of the students has died after an encounter with a strange being. Returning to campus, classmate Dezzi Rae (Ai-Ai delas Alas) begins to torment her about what happened during the trip, unaware they’ve become the target of a vicious local sea monster legend and must stop its rampage across campus. While there’s plenty to enjoy in this segment, one striking aspect does stand out. 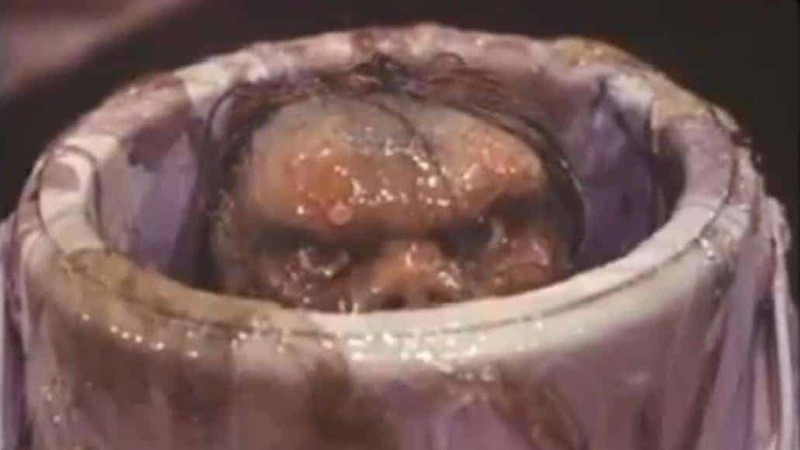 The fact that the sea creatures, looking every bit like the titular beings from the US film “Ghoulies” and even portrayed in the same exact manner at points, are portrayed as stiff, immovable puppets covered in slime really adds a camp factor to their scenes rather than scares. Still, once you move past that, there’s so much to enjoy. The attempts at suspense to keep the creature a mystery, with the use of POV camera-work moving through the water or onto dry land, creates a familiar yet effective sense of suspense with the approaching creature. The tale about the creature living in the lake and the various local legends about it killing those who disturb it is a fine element towards the goofiness of the story. This is enhanced in the second half, with plenty of silly and cheesy monster action. Some of these are comedic, from the creature prevented from exiting the toilet inadvertantly or Maloy continually being caught luring the fictional creature out no one else believes in. Others are serious yet become cheesy through their execution, like the ambush in the shower or the rampage against the party guests which offers up some serious action scenes. While this is easily long enough to be a regular feature with a bit more added to it being as long as it is, overall this segment really scores nicely. 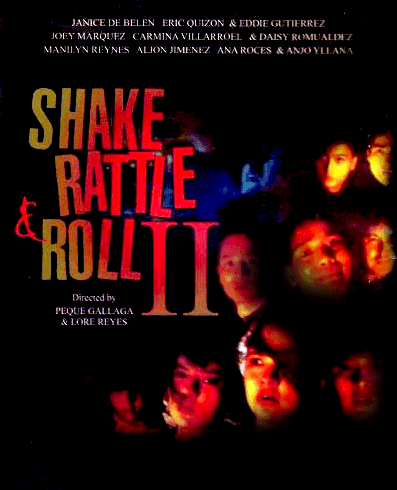 As with most anthologies, some of the segments in ‘Shake, Rattle and Roll III’ do have problematic areas; however, for the most part, this is still another highly enjoyable and overall fun entry in the series that keeps up the fun from before. Go into this entry if you’ve been on-board with the previous entries or a die-hard Anthology aficionado, while those unwilling to grant it some liberties should heed caution.